ENCUENTRO NYC Colombian Music festival, founded by musicians Pablo Mayor and Anna Povich de Mayor, moves underground for its 14th anniversary to celebrate Latin American Culture week with a multi-cultural spin to feature a new festival series-Encuentro Underground-celebrating the roots of Colombian music at one of NYC’s newest artistic centers in the South Bronx. ID Studio (311 E. 140th St., two blocks from the 6 train just past Harlem 125th) the home of theater, music, and dance luminaries actor German Jaramillo, musician Pablo Mayor, and dancer Daniel Fetecua, will host the first in this series of unique events bringing together music, dance, and culture. Tickets include a pre-concert reception and an opportunity to see these world-renowned artists up-close. Second set includes a post-concert DJ’d dance party for those who bring their dance shoes. Celebrating Latin American women in the arts, ENCUENTRO NYC will present the first in the underground series with a noche flamenca (night of flamenco), showing the Spanish roots of Colombian music through the artistic prowess of Rebeca Tomás and her A Palo Seco Flamenco Dance Company, paired with the diverse traditions of Colombia presented by Colombian visionaries, musicians and Encuentro NYC veterans Pablo Mayor and Gregorio Uribe, the Folklore Urbano NYC trio, with dancer and choreographer Daniel Fetecua. This show will trace Colombia’s roots to its Spanish beginnings, drawing parallels and creating new opportunities for cross-cultural expressions. 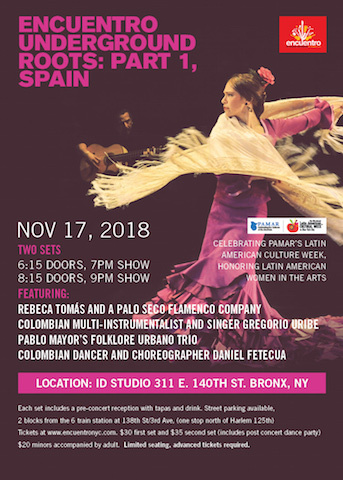 The evening will consist of two-ticketed sets, each with a pre-concert reception to include tapas and drink, followed by an intimate live-recorded show in one of NYC’s most important Latin American art incubators-ID Studio. Second set follows with music for dancing. ID Studio is a part of NYC’s newest frontier, a neighborhood just across the river from Manhattan, one stop from the Harlem 125th subway station on the 6 line, a 2-block walk in a historic preservation district that is home to a new art world. The beautifully renovated brownstone sits next door to the cutting edge and active BronxArtsSpace, down the block from the public library, and around the corner from the police station, with new art cafes, breweries, and restaurants popping up in the neighborhood. The audience will have the opportunity to be a part of the first live-recorded event in the space, using the music studio’s newly inaugurated recording studio. “This year’s Encuentro NYC will breathe new life into our way of looking at Colombian music, focusing on opening our arms to the cultures who represent the source from where this music has evolved. In celebrating our multi-culturalism, we become more aware of how we are all connected through music and dance,” says co-director and artist Anna Povich de Mayor.